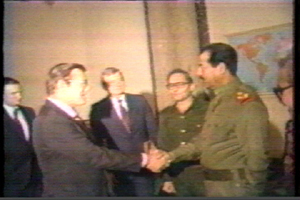 America's sock-puppet government in Iraq executed Saddam Hussein today. Death by hanging. Safely ensconced near their Green Zone homes, fully guarded while wearing fully hooded black masks so no one could identify them, Baghdad’s new pretend rulers put a noose around former dictator's neck and sent him to oblivion. I'm not a fan of dictators, at home or abroad, nor am I a fan of state-sanctioned capital punishment but the first thought that crossed my mind was, 'One down, one to go.” Unfortunately only a fool would believe Baby Doc Bush will ever be held responsible for his numerous crimes against humanity. The vile dictator has been dispatched and now the glorious and freedom loving people of Iraq will unite behind their proud and noble leaders to create a Western beacon of democracy and hope in the Middle East. Even the oil companies are unlikely to be able to extract anything profitable from Iraq in its current state, nor is Iraq's current state likely to change in the near future. The only thing that has changed is the one man who could most clearly and powerfully enumerate and elucidate the relationship between America and Iraq is gone, his lips forever sealed as tight as the White House archives of Papa Doc Bush (or 41 or Dad as the boy-king in our most powerful executive suite calls him). With the execution of Hussein (and the deaths of most of his close circle of confidantes), we now have only one version of what was said during the meetings between Donald Rumsfeld and Hussein during the Iraq-Iran war. No messy questions of where the outlawed chemicals and biological agents came from, of who was whose surrogate. Now we only have the sanitized, Americanized version of what was said to whom, who supplied what, and what promises were made prior to Iraq’s invasion of Kuwait in 1990. I feel the burden of truth being lifted from my shoulders, not unlike the burden of his head was yanked from Saddam’s body.